As Julio César Falcioni turned to embrace his coaching staff and Juan Román Riquelme stretched his arms heavenwards in joy the players of Universidad de Chile and their passionate support shared a moment. But it wasn’t the feeling joy that they had come accustomed to in the 98 games since January 2011. Instead the feeling was disappointment. The chance to add a Copa Libertadores to the 2011 Apertura, Clausura and Copa Sudamericana titles had disappeared; once again at the semi-final stage – the second time in three years. La U needed to overturn a 2-0 first-leg defeat against an imperious Boca Juniors side. Fatigue had began to perturb ‘El Chuncho’ in recent weeks and despite one last valiant effort La U were – deservedly – prevented from making history. Chances did materialise but Boca were in control throughout and should have wrapped the game up as a contest before Darío Ubríaco blew for half-time. Both teams made two changes apiece to the sides that lined up for the first-leg. For Boca Clemente Rodríguez returned from injury to replace one of the goal scorers from last week, Juan Sánchez Miño, while Juan Insaurralde’s injury meant a start for Matías Caruzzo alongside Rolando Schiavi at the heart of the defence. Falconi kept his side in their 4-3-1-2 that has worked so well for them throughout the duration of the tournament. Jorge Sampaoli not only changed personnel but he changed the formation of the side. Out went Albert Acevedo and Gustavo Lorenzetti with Guillermo Marino and Francisco Castro coming into the team as the Argentine coach switched to a 4-3-3 to counter the threat of Juan Román Riquelme. Sampaoli felt that the playmaker was afforded too much space and time when he moved out to the left flank as pinpointed in the analysis of the game last week. It was billed as one of the games of the year. Argentine champions versus all-conquering Chilean champions. Pragmatism versus exciting fluidity. Defensive organisation versus exhilarating attacks. But what transpired was Boca Juniors showing world football that there is more to their game than organisation and counter-attacks. And once more Universidad de Chile is left with it all to do in the second-leg of their Copa Libertadores semi-final tie. In the previous round they scraped past Paraguay’s Libertad on penalties while the tie before that saw El Chuncho overturn a 4-1 first-leg deficit with a 6-0 victory in Santiago. But this time it is different. This time they trail 2-0 to Boca. A Boca side who have conceded just 20 goals in their previous 36 league matches. A Boca team who give off the aura of perennial winners. It was expected that Boca would defend deep and attack the spaces La U left behind with swift counter-attacks. Yet Julio César Falconi and his side took a risk – with Juan Román Riquelme in tow – pressing La U high which led to both goals; scored by Santiago ‘El Tanque’ Silva and Juan Sánchez Miño. Counter-attacking weapon Clemente Rodríguez missed out at left-back and was replaced by Sánchez Miño while Pablo Mouche started up front . . . and had the game of his live. La U, lining up in their usual 3-4-3 variant, was visibly shaken to the point they failed to emerge from their slumber, constantly losing possession and lacking in any defensive organisation. The latter a problem that is becoming all too frequent for Jorge Sampaoli. Universidad de Chile returned from their latest Copa Libertadores trip in much better fettle than they did from their last trip where they fell 4-1 to Deportivo Quito in Ecuador, before winning the second-leg 6-0. 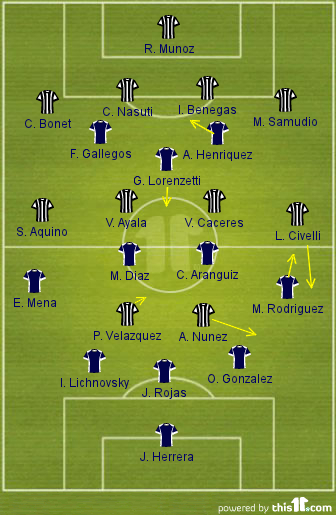 However the opening period did not go to plan as Libertad, time and again, got in begin Los Azules’ defence; Osvaldo González in particular struggled to adapt to the pressure put on him and the space around him. The opening goal from Paraguayan international Victor Cáceres came from the space down La U’s right flank. The home side’s pace and pressing led to a number of counter-attacks. But La U survived and gradually imposed themselves; Ángelo Henríquez coming closest to forcing an equaliser before half-time. The Chileans influence grew in the second half and they equalised through Gustavo Lorenzetti’s deflected strike before the game slowed down and settled into a stop-start contest. Universidad de Chile’s substitute Emilio Hernández was sent off towards the end. In Europe’s Champions League overturning a three goal deficit in the knock-out stages is seen as unlikely. But in South America’s equivalent, the Copa Libertadores, things are little crazier, a little more hectic and a little more manic. Due to the vast distances teams have to travel and the differing altitudes games are played at the home teams are often handed an advantage. Overturning a three goal difference in South America is seen as entirely possible. Universidad de Chile travelled to Ecuador two weeks ago this Thursday to play Deportivo Quito in a city – second to La Paz – infamous for its altitude; some 9,200ft above sea level. La U had dealt with Quito’s altitude before. Only in December past did they win against LDU Quito. And then you factor in their young, fit, dynamic and talented squad as well as Chilean teams adaptability at playing at altitude. Juan Román Riquelme. The name synonymous with Argentine number 10’s. The name that flows of your tongue like a passing move orchestrated by Juan Román himself. The ultimate enganche. El Diez. And JRR was at it again last night, providing another master class as Unión Española fell from the Copa Libertadores at the last-16 stage. Despite a late Santiago Silva goal in the first-leg and trailing 2-1 there was hope for the exciting and expansive Española in front of a packed Estadio Santa Laura. That was until one of the great artists, his right foot a paintbrush, decided on having another performance not to be forgotten. Involved in every goal Riquelme led Boca to a 3-2 win setting up a quarter-final tie with either Fluminense or Internacional. 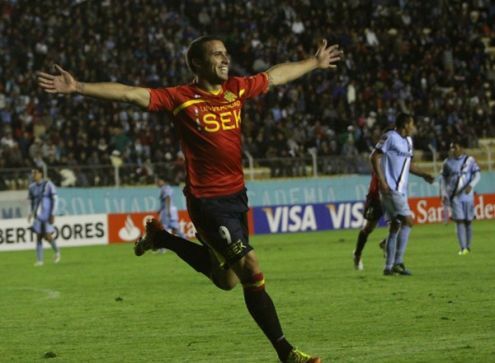 While having their chances, especially in the first-leg, La Furia Roja, led be José Luis Sierra, can exit the competition with their reputation enhanced, playing a thrilling 4-3-3 that saw victory claimed in Bolívar of all places. Unión Española was five minutes from recording a famous result in one of football’s most iconic venues. With barely five minutes remaining a Santiago Silva goal for Boca Juniors to make it 2-1 edged a tight encounter in the Argentines favour. La Furia Roja trailed at the break from a splendid Juan Román Riquelme goal but fought back in the second half, scoring a deserved equaliser but could not hold on and take the away goal back to Chile for the second leg this week coming. Although they will have to do so without Uruguayan Diego Scotti who was needlessly sent-off. 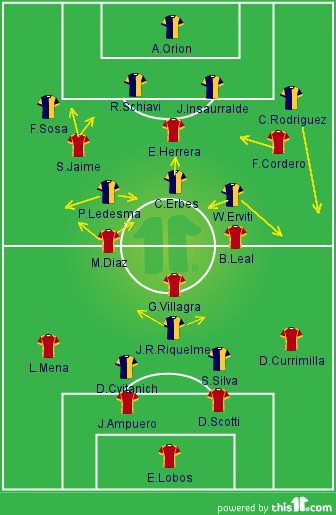 From the offset it was clear that this was going to be a high quality encounter with Española looking to play the ball quickly through midfield and into their front players while Boca naturally looked to involve Juan Román Riquelme while offering additional width through their full-backs, especially left-back Clemente Rodríguez. Out of possession the Chileans were happy to retreat onto the half way line meaning there was little pressure on Cristian Erbes the central of the three midfielders. He would therefore look to build attacks from deep and with options further ahead limited due to Española sitting back he was forced to look for longer passes into Santiago Silva or out to the wings where either his fellow central midfielders had shuttled or one of the full-backs. Española’s worry was when the ball was played into their half and the midfield pressed. The defence would not come with them allowing Riquelme to find ample space in front of the back four and goal side of Gonzalo Villagra. With two Boca strikers occupying the defenders no one was willing to step out and close him down. There was evidence of this after 15 minutes and on the stroke of half-time. The first instance saw Riquelme collect possession, turn and force Eduardo Lobos into an unnecessarily acrobatic save. The second was more dangerous as he clipped a delightful ball over the defence from just outside box for Darío Cvitanich, making a run across the defence, who laid a pass into the supporting Walter Erviti and Lobos was again forced into a save. And the only goal of the first half came about when Riquelme was left unattended outside the box. But this time it was after an 11 pass move, the last four of which were devastating. Pablo Ledesma played a sweeping cross field pass to the advancing Rodríguez. The left-back, unopposed, knocked the ball first time into Riquelme who was in acres of room at the edge of the box. As everyone shaped to shoot the genius that is Juan Román laughed at us mere mortals by firing in a disguised pass with the outside of his right boot to the feet of Cvitanich before receiving the return and with his ‘weaker’ left-foot dispatching a shot across Lobos into the bottom corner. Any replay of the goal should come with the warning ‘Genius at Work’. While most salivate over Riquelme – and rightly so – it should be noted the part Rodríguez plays; a staple of the way Boca set out. With a narrow midfield a lot of width is provided by the full-backs and Rodríguez, like he and to a lesser extent Sosa done for most of the match, bombed forward. Dagoberto Currimilla not up against a direct opponent was dragged inside to where he expected play to take place, drawn to the blue shirts; opening up room for Rodríguez’s run which was not tracked. However Unión Española was unfortunate to be trailing at half-time. Arguably, La Furia Roja was the better side in terms of keeping the ball and creating chances. As mentioned they would drop deeper than we usually see from José Luis Sierra’s men with the formation resembling 4-1-4-1 as the two wide forwards would play more as wide midfielders when out of possession. But in terms of attacking it was the normal Española. Sebastián Jaime and Fernando Cordero stayed high as Emmanuel Herrera linked up play, normally combining with Mauro Díaz who was afforded a floating role moving freely about the pitch and impressing at doing so. It was when they worked the ball quickly to the right to inverted winger Fernando Cordero. Neither the fastest nor trickiest but if given time to get the ball onto his left-foot more often than not he would deliver a fine ball. Both Emmanuel Herrera and Sebastián Jaime should have done better with freed headers in front of goal. Cordero himself went close with two curling efforts having cut in on his left. This was when La Furia Roja were at their free-flowing best, Villagra protecting and Díaz and Braulio Leal scheming in midfield. But it was harder for the Chileans when they couldn’t get the ball forward quickly. 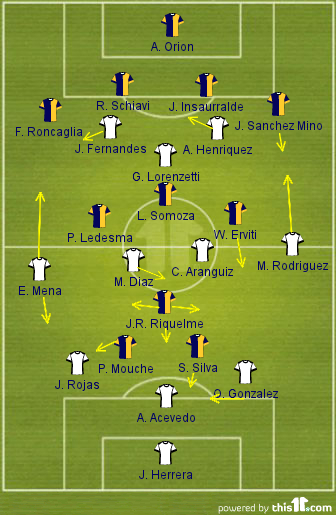 The longer they held onto the ball Boca would sink into a 4-4-1-1, Riquelme shuttling left and Silva dropping off behind Cvitanich. There was little to write about in terms of tactics or action in the second half until Española, out of nowhere, equalised. A harmless ball out of defence looked simple for Rolando Schiavi and Juan Insaurralde. However both were drawn to the ball and a flick from Herrera sent Jaime scampering free through the middle of the defence before a confident finish. Rodríguez was too far left to cover for his centre backs mishap. Naturally the goal provoked Boca into pushing and pressing higher up the pitch. It seemed as if the game would be defence v attack for the last 15/20 minutes but Española were brave and José Luis Sierra brought the forward thinking and piercing winger Jean Paul Pineda on for Jaime when it may have been sensible to bring on Rodolfo Madrid. Erviti almost grabbed a deserved goal for his all round performance with a piece of individual brilliance, dancing round a handful of challenges but seeing his shot come back of the post. Boca turned the screw with a final substitute; Julio Falcioni replacing Erbes – whose influence had waned – with Juan Sánchez Miños. Erviti now found himself as the central midfielder with Sánchez Miños wider on the left. It turned out to be a well-judged move by Falcioni. With the more dynamic Erivit in the middle the ball was moved quicker and Boca played with at a quicker tempo with greater width. 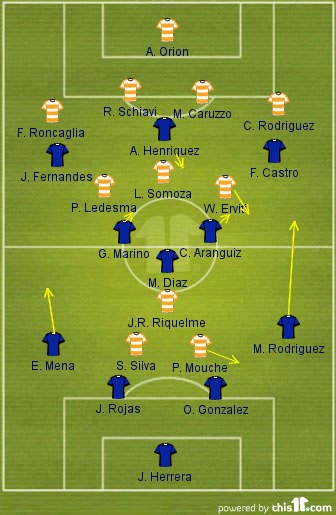 Miños had a positive impact but the winning goal came from the right-side where Pineda’s inability to protect the ball on the half way line was taken advantage of by Rivero who pressed, won the ball and gave it to substitute Pablo Mouche who exchanged passes with Riquelme before standing up a cross for Santiago ‘Battering Ram’ Silva to head the winner. Martin Palermo watching on would have been proud of the finish. The Chileans frustrations in conceding the late goal were shown in Diego Scotti’s wild hack at Riquelme which earned him a straight red card. Unión Española put an end to an 18-year maleficio (curse) by reaching the last-16 of the Copa Libertadores last night with a 2-1 win at home to Bolívar. Española went into the game at the Estadio Santa Laura knowing they would progress from the group stage for the first time since 1994 with a game to spare if they collected all three points. And thanks to goals from Braulío Leal and Emmanuel Herrera they done exactly that; surprising many simply by qualifying. The Bolivians started well as they disrupted the rhythm of La Furia Roja but they could not keep the Chileans at bay for too long, Leal, unmarked, flicking in a corner, which in itself was flicked on at the front post by Jorge Ampuero, from inside the six-yard box in the 18th minute.